Silent Hill Heaven • View topic - Intrigued by Temple-like structure in intro FMV- what is it? Intrigued by Temple-like structure in intro FMV- what is it? Post subject: Intrigued by Temple-like structure in intro FMV- what is it? Long time admirer of the forum, first time poster. I have tried to trawl previous posts to see if this has already been addressed - if it has, apologies in advance. 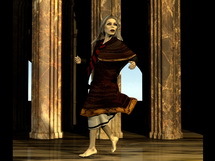 In the opening FMV to Silent Hill 1 there is a rather interesting clip - no more than about four seconds - that shows Dahlia running through some kind of Greek temple-like structure. She stops, turns around, and stares in horror at something off-camera. The camera pans around, but the videos cuts to the house where Alessa was burned before we see what left Dahlia so spooked. 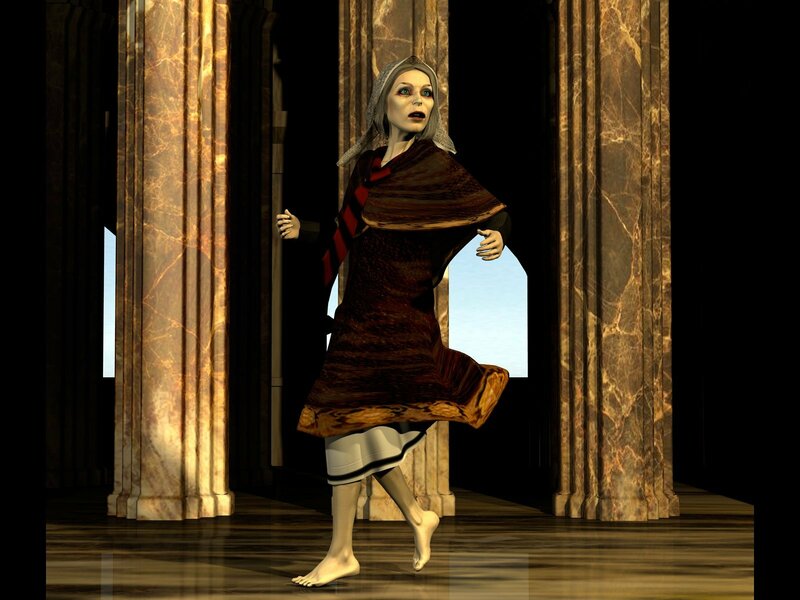 Below is a still from the FMV that shows the pillars of this "temple" in the background. A friend of mine who is otherwise a very reliable source on video game lore tells me this scene is the only remaining evidence of an alternative "church" in the game that was replaced later by either the Judeo-Christian Balkan church or the Other Church in the antique shop. I can find no trace of this theory online and for some time dismissed it as his own unfounded fancy - has anyone from the forum heard this before? If anyone knows anything else about what this scene alludes to, in terms of the plot or simply the game's development, I'd be really interested to hear from you. I haven't heard of that information either. In what way is your friend a reliable source? I would assume it was just some leftover assets that were cut or just B-Roll that was generated for the opening. If it were leftovers, it would be curious to know what the context was for it, like you said. I recently started replaying SH1 and it got me thinking about this again for some reason, so I scoured the web. Not a single mention of anything to do with this that I can find, not a scrap, nada. The only thing that I can think of is that your friend may have seen a Beta screenshot in a Magazine, which does happen, and they took it out of the game but left it in the FMV and he recognised it, but no mention online of it anywhere. That may be what happened but I don't know. Seems quite possible to me. Unless of course your friend works for Konami. It could be the inside of the Balkan Church, where Harry meets Dahlia. ^That's kinda what I always thought when viewing the intro trailer casually. Especially since, earlier in the trailer, a clip is shown of a crucifix which is much like the one hanging up behind the pulpit in the Balkan church, if I'm remembering correctly from in-game. And there are pillars in that church as well. It could be that same church, but watching it again, there do seem to be differences- it does kind of seem like a larger structure than that church, and also appears to have windows in it. I don't believe the church we enter in the game has windows. It also looks to me like there's a body of water outside the windows. Maybe this was an earlier concept of the church, located near the lake. But who knows? Last edited by phantomess on 11 Oct 2016, edited 1 time in total. Well, there is another picture available, showing this scene. We can see that it's definitely NOT the Balkan Church, or the "Other" Church. No official guide says what the shot is, and the background itself looks heavily unfinished and barren. This is probably just a clip made for the intro FMV, similar to Harry & Jodie finding Cheryl, Lisa and Michael fighting, and the highway scenes. I really don't think it's anything. As people said, it could just be the Balkan church or the alternate church and was changed. From what I remember, there's a lot of things in the opening FMV that didn't end up really being in the main game. Considering all the FMVs were done by one person from I recall, I wouldn't be surprised if he more or less just did things that felt right with the theme of the game. Given the circumstances, it wouldn't really be worth changing them up and making some of them closer to what ended up in the game. More than where she was, I always wondered what she was looking at. My pet hypothesis is that we are witnessing Dahlia performing her version of "gyromancy," the occult ritual that foretold Harry's arrival, and she has just viewed the premonition. I'm reiterating it being the Balkan Church, most Christian temples are modeled after the Greco-Roman design, cultural assimilation what not. Plus you can kinda see these pillars in the Church scene. It definitely looks like it's a cult temple to me, not the Balkan or any other Christian church. As to what Dahlia's seeing, who knows? I think a lot of the stuff in the intro is just meant to "set the mood" rather than mean anything specific, that part seems to me to simply be implying to first time players that there's some Religious strangeness going on in this town.